^ „Facts on the Nobel Prize in Physiology or Medicine”. Nobelprize.org. Приступљено 12. 07. 2010. Comfort, Nathaniel C. . The tangled field: Barbara McClintock's search for the patterns of genetic control. Harvard University Press. Cambridge, MA.. . 2001. ISBN 0-674-00456-6. Kass, Lee B. and Christophe Bonneuil. 2004. 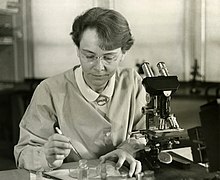 "Mapping and seeing: Barbara McClintock and the linking of genetics and cytology in maize genetics, 1928-1935". Chapt 5. стр. 91–118, in Hans-Jörg Rheinberger and Jean-Paul Gaudilliere (eds. ), Classical Genetic Research and its Legacy: The Mapping Cultures of 20th Century Genetics. London: Routledge. Keller, Evelyn Fox (1983) A feeling for the organism. W. H. Freeman and Company, New York. ISBN 0-7167-1433-7. Kass, Lee B. 2000. "McClintock, Barbara, American botanical geneticist, 1902-1992". стр. 66–69, in Plant Sciences. edited by R. Robinson. Macmillan Science Library, USA. Murphy, R.P. and L.B. Kass. 2007. Evolution of Plant Breeding at Cornell University: A Centennial History, 1907-2006. Department of Plant Breeding & Genetics, Cornell University, Ithaca, NY. стр. 1–98, Appendices A1-A98, Photo Section P1-P38. (July 2007). McClintock, Barbara. (1987). The discovery and characterization of transposable elements: the collected papers of Barbara *McClintock. ed John A. Moore. Garland Publishing, Inc. ISBN 0-8240-1391-3. Nina Fedoroff and Botstein, David . The Dynamic Genome: Barbara McClintock's Ideas in the Century of Genetics. Cold Spring Harbor Laboratory Press. New York.. . 1993. ISBN 0-87969-396-7. Barbara Maklintok на Викимедијиној остави. Ова страница је последњи пут уређена на датум 30. децембар 2018. у 01:04 ч.